Five New School employees have been singled out for their outstanding performance on the job. Every year the university awards the Service Excellence Award recognizing the contributions of a member of the administrative, clerical, facilities, or security staff of The New School community. These 2012 winners represent a cross section of the talented individuals who come to work at The New School every day. 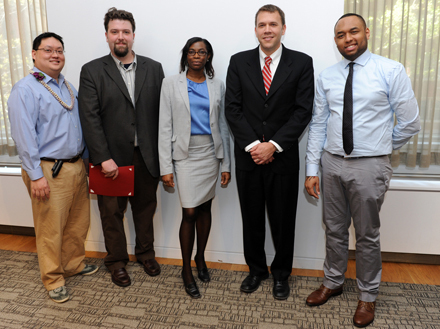 (Left to right) Justin Li, assistant director, Student Support and Crisis Management, Student Services; Charles Whitcroft, senior secretary, Anthropology Department, New School for Social Research; Andrea Swaby, office assistant, Registration Office; Jeremiah Asbury, programmer analyst, Information Technology Department; and Martin Willmore, cleaning porter, Facilities Services.